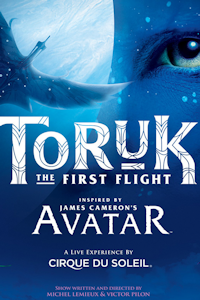 Based on the film Avatar and created in conjunction with James Cameron. Unlike any other Cirque Du Soleil show, this arena production uses stunning puppetry and incredible technology in conjunction with the skills of Cirque Du Soleil to bring the world of Pandora to life. Company Cirque du Soleil. Author Michel Lemieux. Author Victor Pilon. Director Michel Lemieux (multimedia). Director Victor Pilon (multimedia). Director Neilson Vignola (director of creation). Design Carl Fillion. Costume Kym Barrett. Choreographer Tan Loc et Tuan Le. Music Bob & Bill. Musical Director Bob & Bill. Sound Jacques Boucher. Lighting Alain Lortie. Between 20th June 2019 and 30th June 2019 this tour will visit 2 venues in Manchester and Outer London. Current and future dates only. You can embed this tour information on your own website by adding a single line of code to a page and using the Qtix code T01213597767 - for details see our Embed Information page. Receive email notifications of changes to TORUK.